Online: It's been 70 years since India's Partition. There's finally a museum devoted to it. Online: How do you solve a Problem like Partition? Online: Seventy years after Independence , where does India stand with Britain now? 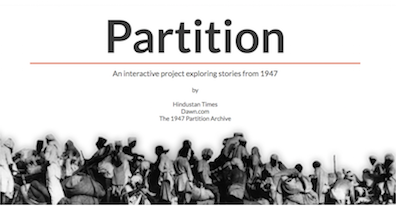 August 13, 2017 | NPR -- Washington, D.C.
Hindustan Times and Dawn.com collaborate with The 1947 Partition Archive in bringing you an educational and exploratory portal showcasing stories, maps and commentary related to Partition. What happened in August 1947? California is collecting memories of India's Partition. (Reprint from Khabar article, May 2012) Online: Harnessing the Power of Stories. Online: 'Art for Partition' benefit event at Berkeley Skydeck. March 28, 2013 | KPFA - 94.1FM (KPFA.org) -- Berkeley, CA. Apex Express contributor Tara Dorabji interviews author Bapsi Sidhwa and Archive staff Maya Smith, who spearheaded Art for Partition, The 1947 Partition Archive's first public education event on Partition. Dr. Bapsi Sidhwa is guest speaker at the event. Spring 2012 Issue. Print: Harnessing the Power of Stories: Uncovering the People's History of Partition. April 26, 2012 | KPFA - 94.1FM (KPFA.org) -- Berkeley, CA. Apex Express contributor Tara Dorabji interviews volunteer Ranjanpreet Nagra who has traveled through India, Canada and the United States collecting oral histories from Partition survivors. Click to listen to Ranjanpreet's interview.Interview begins at 20:30. April 18, 2012 | Radio Zindagi - 1550AM -- Fremont, CA. An interview with Volunteer Iram Nawaz is featured on the Community Hour show hosted by Sheetal Ori. Iram speaks about The 1947 Partition Archive and the upcoming Indus Heritage Day event to be held at the India Community Center in Milpitas. Indus Heritage Day was co-organized by The 1947 Partition Archive, The India Community Center and the Pakistani American Culture Center in the San Francisco Bay Area. Interview link coming soon! Online: Survivors of British India Partition Record Traumatic Oral Histories. Online: Survivors of 1947 British India Partition record traumatic oral histories. Online: The 1947 Partition Archive preserves traumatic past. Morning mix with Tara Dorabji. Thirty minute feature on Partition by AM Host Tara Dorabji. Tara interviews The 1947 Partition Archive founder, Partition migrants Mr. Muzaffer Haider and Mr. Baljit Chopra, ending the segment with commentary from Prof. Junaid Ahmad from Lahore University of Management Sciences, Prof. Priya Satia from Stanford, and Prof. Angana Chatterji from California Institute of Integral Studies. Listenhere. The interview begins at roughly 7 min, 27 secs. Spotlight on The 1947 Partition Archive on BayAreaDesi.com.